Founder of Provisions Bake Shop (Pelham, NY), wife of a vegan, mother of four, and maker of all things delicious. I’ve mentioned before that I’m very fortunate to have children living in “Foodie” destinations and Portland, Maine is no exception. On a recent visit to see our daughter, Rebecca, we did a Bakery Crawl- how perfect is that! We hit 6 bakeries – all wonderful in their own way. Who knew that in a city of 68,000 we would find so many great places and I’m sure there are more to discover in future visits. Are you ready to go on the Crawl with me? Let me share with you the highlights! They have a great selection of interesting flavors- my personal favorite is the chocolate with sea salt and Rebecca is partial to the gluten free lemon poppy seed. The Standard Baking Company specializes in artisan breads and classic pastries. The baguette has a wonderful crust and I also sampled an apricot almond galette- a rich almond pastry filled with apricot jam- delish!! Third up was Aurora Provisions ( a name close to my heart) auroraprovisions.com/, a place perfect for a great cup of coffee and a small bite. Try the cinnamon bread puffs- you won’t be sorry! It was a great sunny (but cold) day in Portland so we visited the Lighthouse and then hopped a ferry and took a 4 mile walk around Peak’s Island. That made me feel justified in continuing “The Crawl”- wouldn’t you feel the same? So, back in town, it was on to Tandem Coffee and Bakery, http://www.tandemcoffee.com/bakery. Tandem is in a converted garage- so fun to see re-purposed buildings! We sampled two very interesting flavored classics- a banana bread with black sesame and a shortbread cookie but made with rye flour and also rolled in black sesame seeds. You know something’s special when the flavors remain with you long after you’ve eaten it. So stay tuned for a future post when I recreate the rye shortbread for you. Four down and the last two to go. Two Fat Cats Bakery, twofatcatsbakery.com , offers homestyle american cookies, cakes, and pies. They are famous for their Whoopie Pies and rightly so! What a way to end our day…the aromas of freshly baked breads surround you as you walk through the door. Stuffed to the gills we decided to make our purchases and save them for breakfast the next day. The whole wheat sour dough English muffins are simply the best! I’m going to put in a special request to have some brought to me on Rebecca’s next visit home. So that ended our Bakery Crawl adventure- but I’m so looking forward to returning and sampling more! I loved the holidays at my bake shop…We always created special holiday themed treats- from sugar cookies to cupcakes to breakfast treats. On Valentine’s Day you could always find a heart shaped scone for your love. Try these- start to finish in about 1/2 hour. What could be sweeter than for your Valentine to wake up to a special breakfast or to join you for afternoon tea? In a medium bowl whisk together the flour, ¼ cup sugar, baking powder and salt. Slowly add the heavy cream mixing with your scrupulously clean hand until the dough comes together and no dry particles remain. Stop adding cream as soon as the dough comes together. Depending on the weather this could take 1 cup of cream up to 1 ½ cups. Roll or pat the dough to about ½ inch thick. Cut the dough with heart shaped cutters and place on parchment lined baking sheet. With your forefinger, lightly make an indentation in the center of each scone. This helps the dough keep its shape while baking. If not using the glaze, sprinkle the top of each scone with sugar. Bake 14-17 minutes until lightly browned and firm to the touch. When done and cooled, combine the glaze ingredients until smooth. Spread glaze over each scone. Brrr….it’s cold outside! So- that means it’s soup time! This soup is sooooo good for you- cruciferous vegetables, leafy greens and legumes- what more could you want? It’s the ultimate comfort food. 4 quarts of vegetable broth- you know, the ones you’ve made using my technique 🙂 If you don’t have vegetable broth, use water and increase the crushed tomatoes to one 14oz can. 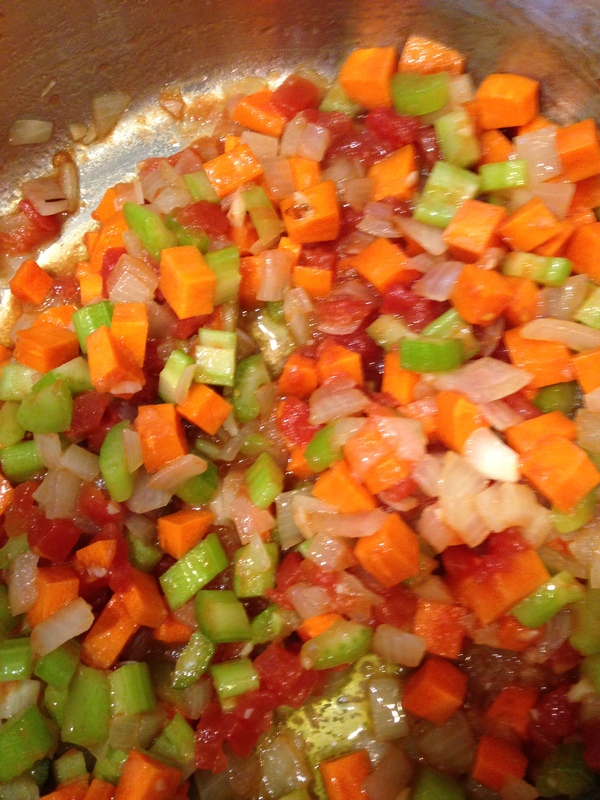 In a large soup pot, saute the onions, carrots and celery in the olive oil until soft. Add the tomato paste and cook, stirring constantly for 2 minutes. Add the crushed tomatoes and lentils and cook for another 2 minutes. Add the broth, salt and pepper to taste . Please note the amount of salt is dependent on the sodium content of what vegetable broth you use. My homemade broth has not salt- so I use about 2-3 tsp of salt for this recipe. Cover and cook over medium heat for 25 minutes. Add the cauliflower and cook for 15 minutes. Add the kale and cook uncovered for another 10 minutes or more until the vegetables and the lentils are soft. Right now with all the political turmoil in the U.S. I find myself turning again and again to comfort food. Baking is my “happy place” and I need to go there often! Who doesn’t find comfort in a slice of warm apple pie? My children had a grade school teacher, Mr. Chidlow, who did many cooking projects with his classes. His recipe for Perfect Apple Pie has been a family favorite for almost 30 years and during the time I owned Provisions Bake Shop we made hundreds of them! In food processor mix flour and salt. Add butter and pulse until mixture resembles coarse meal. Add egg and cream and process until a ball of dough forms on blade. If mixture seems dry, add a DROP more of cream. Divide dough in half and form into 2 discs. Wrap in plastic wrap and refrigerate 1 hour. While the dough is chilling prepare the pie filling. Peel, quarter and core the apples. Thinly slice the apples crosswise. Whisk together the sugar, flour, cinnamon and salt. Add to the apples and toss gently. Roll out one disc of the dough. Line a 9″ pie plate with the pastry. Mound the apples in the pie shell and dot with the 2 TBS of butter. Roll out the second crust and place on top. Crimp the two crusts together. Brush the top crust with the egg wash and sprinkle with sugar. Cut 3 or 4 air vents in top crust to let out steam. Bake for about 50 minutes until apples are soft. (Test by sticking a knife in an air vent). If the crust starts getting too brown before the apples are soft, cover loosely with aluminum foil. I personally like to bake my pies on a parchment lined sheet pan to catch any overflowing juices. We’re so lucky- all our children live in places that have great foodie options! Our daughter, Elyse, and her husband, Rob, live in Walpole, Massachusetts . Walpole is a charming and quaint New England village just a hop, skip and a jump from Boston. However, there’s no need to travel to the city for great food. Walpole has much to offer, but hands down our favorite place to go is Farmer in the Dell. Farmer in the Dell makes great homemade meals and desserts to either eat in or take out. Offerings include Breakfast sandwiches on biscuits, homemade flatbreads, great salads, soups, the best coffee around and wonderful desserts and baked goods! One wintry evening we had dinner there- the Sweet Potato Chili with Quinoa was excellent and I kept thinking about it after I returned home to New York. Here’s my version of it- it’s very easy to make and soul warming on a chilly winter’s eve! In a large pot, saute the onions for about 5 minutes. Add the garlic, jalapeno and chili powder and continue cooking over low heat for another 5 -10 minutes until the onions are soft. Stir often. Add the sweet potatoes, 3 cups of broth, salt and pepper. Bring to a boil. Add the beans and the quinoa and more broth if needed. Return the chili to a boil and cover the pan but leave the lid ajar. Cook for another 15 minutes until the potatoes are tender and the quinoa is cooked. It’s snowing outside – perfect time to be in the kitchen and create!! These cookies are a snap to make and a perfect accompaniment to a nice “cuppa” tea. Whisk the flour and salt, set aside. Beat the butter and sugar together until combined. Add the flour and salt slowly. Fold in the cranberries and pistachios. Roll the dough into a log about 1 ½ inches wide. Roll the log in the sparkling sugar. Wrap the log in parchment or wax paper. Chill until firm. When dough is firm, slice about 1/3 inch thick. Place on parchment lined baking sheets about 1 inch apart. Bake 15-18 minutes until the cookies are set and very slightly golden on the edges.